The renovation of Brookwood Village, a two-level 1970’s shopping center with department store anchors at each end, has visually turned the inward–focused mall outward with a “Main Street” frontage. The landscape architect worked with architects HKW Associates to create the new pedestrian–friendly approach. Previously, the mall presented only massively-scaled parking decks to the adjacent Shades Creek Parkway. 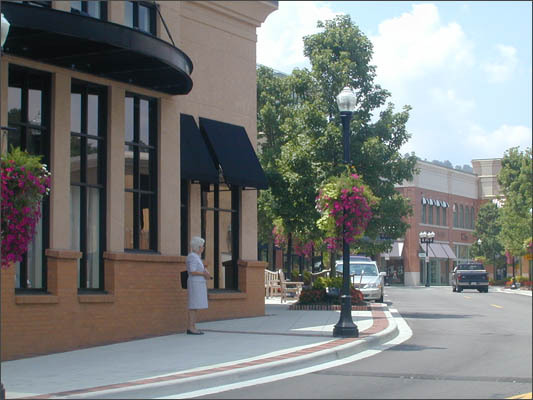 A new 2-lane public street has new storefronts on the mall side and restaurants on the outside overlooking Shades Creek. The street alignment is angled at each end to create a sense of enclosure. Wide, tree lined sidewalks with attractive street furnishings make the new approach appealing to both pedestrians and motorists. A fountain plaza placed opposite the new conservatory-like entrance to the mall anchors the space and provides outdoor dining space for adjoining restaurants.